Displays the path to the folder currently opened in the active panel. This folder is supposed to contain the up-to-date set of files. Displays the path of the folder currently opened in the passive panel. This folder is supposed to contain the outdated set of files. If selected, this option causes AB Commander to copy the newly created files from the active to the passive folder. If this option is not selected, then the files that don't already exist in both the active and the passive folders will not be synchronized. If selected, this option causes AB Commander to copy the newly created sub-folders (and all files they might contain) from the active to the passive folder. If this option is not selected, then the subfolders that don't already exist in both the active and the passive folders will not be synchronized. If selected, this option causes AB Commander to synchronize the files that already exist in both the active and the passive folders. If the passive folder contains older versions of the files from the active folder, they will be replaced with their newer versions from the active folder. If this option is not selected, then the files that exist in both the active and the passive folders will not be synchronized. If selected, this option causes AB Commander to synchronize the sub-folders that already exist in both the active and the passive folders. If the passive folder contains older versions of the files from the active folder, they will be replaced with their newer versions from the active folder. If this option is not selected, then the subfolders that exist in both the active and the passive folders will not be synchronized. If selected, this option causes AB Commander to synchronize the files that already exist in both the active and the passive folders that have the same last modification times, but different file sizes. Such a situation can occur, for example, after you use the Resize Images command: while resizing or rotating the image files, it preserves their time stamps. Select this option to make sure that such image files get synchronized properly. This option has the effect opposite to the Update files option: you can use it to restore the older versions of the files, if for some reason you want to discard the updates made to them since the last backup. If selected, this option causes AB Commander to synchronize the files that already exist in both the active and the passive folders: if the passive folder contains newer versions of the files from the active folder, they will be replaced with their older versions from the active folder. If this option is not selected, then the files that exist in both the active and the passive folders will not be synchronized. If selected, this option causes AB Commander to delete those files from the passive folder, which do not exist in the active folder (the orphan files). If this option is not selected, such files will not be deleted from the passive folder. 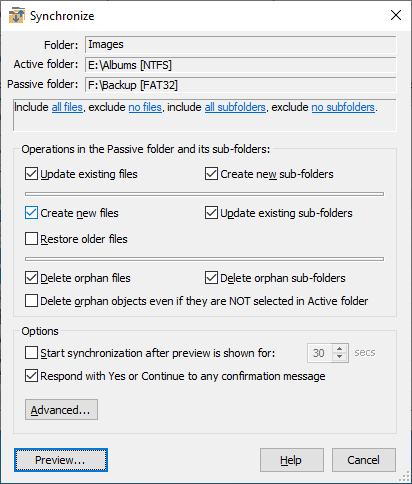 If selected, this option causes AB Commander to delete those sub-folders (and all files they might contain) from the passive folder, which do not exist in the active folder (the orphan sub-folder). If this option is not selected, such sub-folders will not be deleted from the passive folder. If this option is selected, it causes any file or folder that does not exist in the active folder (but not in its subfolders) to be deleted from the passive folder. You can use this area to restrict the set of files and/or subfolders that should be subject to the synchronization. For example, if the active and passive folders contain a mixture of files of different types, but you only want to synchronize the image files that have the file name extension JPG, then you could specify the include files mask as *.JPG, and all other files would be ignored during the synchronization, as if they were not present at all. Note that the exclude masks take precedence over the include masks. If selected, this option makes AB Commander start the synchronization automatically after displaying its Ready to Synchronize window for the specified number of seconds. If this option is not selected, then AB Commander will start the synchronization only after you give an explicit command, by pressing the Synchronize button on the Ready to Synchronize window. If this option is not selected, then in certain situations Windows may ask you to confirm a file operation, such as to overwrite or delete an existing file, etc. If such situations are expected, you may want to select this option and Windows should confirm such prompts automatically for you. 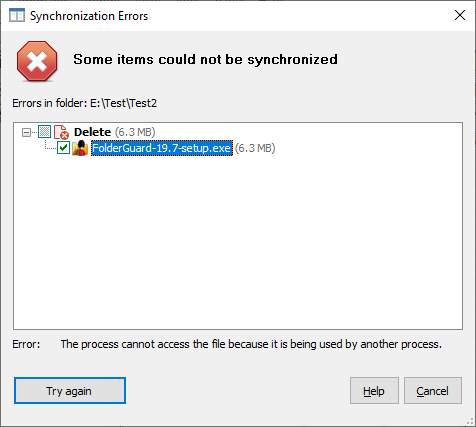 Note that while this window is displayed, no actual synchronization is performed yet, and no files or folders have been copied, updated, or deleted. You can review the proposed operations listed in the Delete, Create, and/or Update groups to see exactly which the files and sub-folders are going to be synchronized. 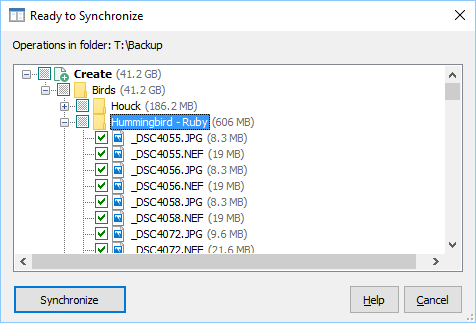 You can exclude some of the file and/or sub-folders from the synchronization by clearing the check marks displayed next to each item in the list. Also, while comparing the files and folders, AB Commander skips some system files and folders (such as the Recycle Bin and System Volume Information folders) and excludes them from synchronization automatically for you. Note that each file has its size displayed next to the file name. For each folder, the size displayed includes the cumulative size of all files and subfolders that belong to that folder.